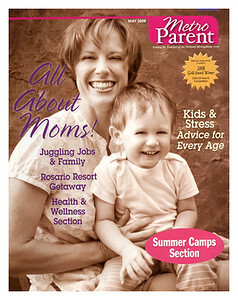 This is the fourth year one of our portraits has graced the cover for the Metro Parent’s Mother’s Day issue. It’s a treat to showcase our imagery but we really love being able to show off some of the super mom’s we get to meet. This year Joanna and Adi’s joyful portrait was chosen. Joanna is another mama-entrepreneur who balances nurturing her family and caring for her business, Ground Springs Healing. Not only do they specialize in the healing arts they also have an amazing foot spa Joanna developed called Pedistone. Hey Dads – another great Mother’s Day gift idea! I have yet to meet a mom who doesn’t love a little foot pampering.